October 30, 2011 By Katie P.
If only all obituaries were this informative! Here we have the complete birth date, location, marriage date, wife’s full name, immigration year, children’s names and locations, and memberships. Finding out the specific area of origin from “across the pond” can be pretty difficult to come by. Cardiganshire, as listed in the obituary, is one of the thirteen traditional counties of Wales. In 1996, the county was reconstituted under its historical name of Ceredigion. Welsh immigration into what is now known as Cambria County, Pennsylvania began in 1796. Most of which were skilled industrial workers, such as miners. The name Cambria is actually the latinized version of the word Cymru, meaning “land of Welsh.” To this day, Pennsylvania has the largest population of people with Welsh ancestry. 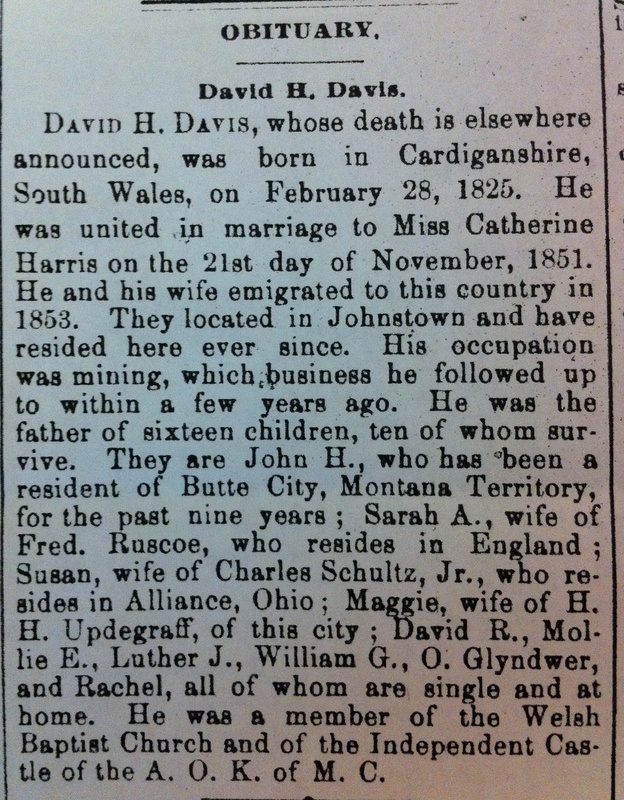 For more information on David Davis’ wife Catherine Harris, click here. Thanks for the interesting post! I especially enjoyed the Pennsylvania trivia.